Review sessions offered to A. James Clark School of Engineering students are available online. Review Sessions are accessible after being approved by this form. Why get an EIT/PE? Receiving these certifications shows continued interest in the subject, especially to employers. Only a PE can sign & seal documents regarding public property. Also, your salary may increase with these certifications. Requirements for the PE: Receive an ABET-accredited education, take the FE, receive engineering experience, and sit for the PE Exam. 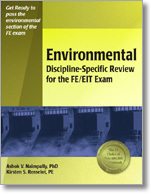 FE Exam Requirements: Students should take the exam as early as possible. In Maryland, eligibility for the exam begins at a student's last semester of college. PE Experience Requirements: Must have 4+ years of experience working under a PE. Most graduate programs will count towards one (1) year of experience, regardless of the length of the graduate program. PE Exam Experience: Test-takers select a specific subject for this 8-hour, written exam. PE License: In Maryland, licenses are valid on a 2-year basis with a maintenance fee of $78 per 2-years. You may apply to be a PE in other states, but reciprocity may differ in each case. Registering for exams: Go to NCEES.org. You register for a time to sit for the exam a few months in advance. When choosing which exam to take, take the one which suits you. In the end, one EIT certification is the same as the next, and the exam you took to get there is not of importance. Taking the FE exam: The exam consists of ~110 questions on a computer-based format. A reference book is provided. There are a strict selection of calculators you may bring and scratch paper/materials are supplied. 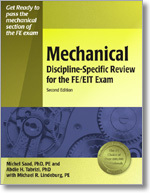 FE Exam Preparation: Know the reference book provided. You may request a copy from NCEES.org. Know the calculator you brought, read all instructions, and prepare for exam day by browsing the NCEES website. What to bring to the FE Exam: Admission form, Calculator, Photo ID, Sweater/jacket. Do not bring hooded sweatshirts, watches, paper, etc. Any scratch materials will be provided. FE Exam Strategy: Relax and stay focused. It's OK to guess, as wrong answers do not carry penalties. Scoring of the FE Exam: Pass/Fail format. Results are usually provided within 7-10 days. Need more info about the FE? PPI2PASS is the premier provider of FE Exam Preparation books. It's the most popular choice among Maryland students and consistently receives high marks on Amazon.com reviews. Which book(s) should I buy? 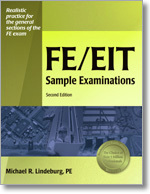 See the "FE exam specifications" on the official NCEES page. 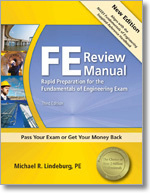 The FE Review Manual will prepare you for the "General" sections. 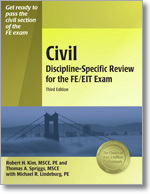 Also be sure to buy the discipline-specific review book in addition to the FE Review Manual. What about the NCEES Manual? The NCEES Fundamentals of Engineering Reference Handbook is the reference book that you may use during the exam. You will be provided with a new copy during the exam and you can buy one to practice with. We do not offer this for sale, but you can buy it directly from NCEES or download an electronic copy for free. Please contact UMDASCE and the appropriate contact will answer. (umdasce@gmail.com). Gain a better understanding of key concepts and save prep time by reviewing FE exam topics and NCEES Handbook equations in a single location. These equations, along with NCEES Handbook figures and tables are distinguished in green text for easy cross-referencing. Use the 13 diagnostic exams to identify where you need the most review, and improve your problem-solving skills with over 1,200 practice problems. You can evaluate your progress by taking the included realistic 4-hour sample exam—it simulates the actual FE exam’s morning session. Designed to prepare you for the FE exam, FE/EIT Sample Examinations simulates the actual FE exam in every aspect, from the format and level of difficulty to the number of problems and the distribution of problems across exam topics.